Keep frozen, Store at -18° or below., Do not re-freeze once defrosted. 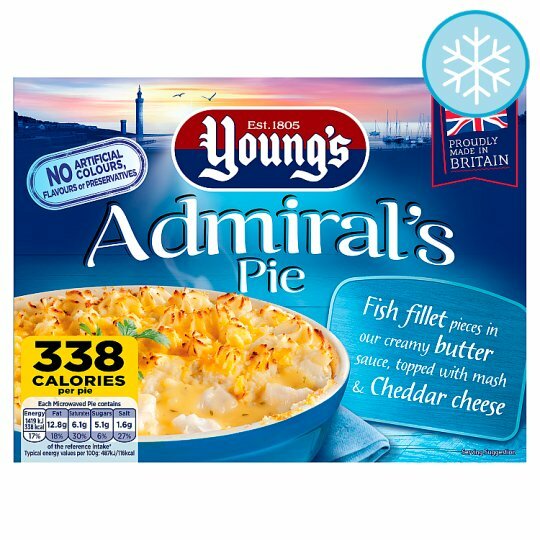 Cooking Instructions (General): Our Admiral's Pie is best oven baked straight from your freezer. Ensure product is piping hot throughout before serving. All appliances vary, these are guidelines only. Microwave (From Frozen): Remove outer packaging and film lid. 800W - Cook for 9 mins, then stand for 1 min. 900W - Cook for 8 mins, then stand for 1 min. Place tray on a baking tray in the centre of the oven and cook for 40 minutes (fan oven 35 minutes).